We also provide wellness or Holistic approach like treating through Yoga, meditation and pranayama. or call us for a telephonic consultation. To know more click on the image below. Now the world has realised the side effects of Allopathic medicines, which just treat for the symptoms and not the root cause of the illness. Now the people are turning to more natural and Ayurvedic/Siddha remedies for chronic types of illness. So call us and book for a treatments to make your lives better. The world is surprised at the flooding of tourist to Kerala in India for traditional body massage and treatments. Treatment for Cancer, Old incurable Diabetic, Leprosy, severe Jontis , Asthma, Bloodpressure, Migraine, Eye diseases, all types of intestinal Ulcers, piles, cardiac problems, thyroid, impotency, incurable fevers, weakness, Nervous disorders like parkinsonism, bed ridden paralytic conditions, etc. We treat various Arthritic, spondylitic conditions like back ache, knee ache, cervical aches, joint pains, simple fractures, sprains, etc and skin diseases like soriasis. are done by me in consultation with my Guru Lakshmana Shiva Siddha Yogi who had been in to Siddha treatment for 51 long years. Order for vcds/dvds/Siddha-Ayurvedic medicine/yoga/kalari courses on payment of an advance amount Medicines are, prepared in traditional ways as per requirement or ailment of the patient. Various hair oils for migraine/thyroid and head related diseases, oils for body pains and skin diseases, Lehyam(Electuaries), Gulika(tablets), choornam(powders), kashayam(decotions), etc are made on order. The patient has to visit our centre on required days at required time, staying in a nearby Hotel of their convenience. Besides this we have wellness programmes like Yoga classes for attaining health and we have special Yoga classes for people with ailments of various types. Also we have Kalaripayat classes (Martial-art training) and arrange demonstrations of Kalari for tourists requested on demand. Our aim is to promote the effectiveness of Herbal remedies and make it known to the whole world, where the Allopathic counter parts fail to cure diseases. We are also making a collection of rare herbal species of plants collected from various parts of India which the new generation is unaware. 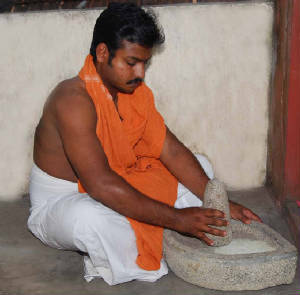 Also we aim to teach this rare skill of Marma chikitsa, rejuvination and revival methods of kalari, secret Ayurvedic remedies, Siddha treatment techniques that had been guarded as a treasure for millennium etc, which is becoming extinct every generation. We are also trying to creating documentary dvds to record these rare skills to be made known to the Martial art lovers and those who love to learn the traditional treatment methods of Ayurveda, Siddha and herbal plants. In future we are also planning to open a Siddha College to promote this great wisdom of the Sages to the new generation. We can only dream of the Siddha college at the moment, as the expenses for buying of the right plot (in acres) and construction of the college requires huge sum. With prayers, we are on the onlook for any generous rich men who have the good heart and can contribute freely from their wealth which God has bestowed him or her. We need your monetary help for this noble cause and to preserve and promote this ancient secret science to the corners of the world. Those who can contribute as charity for uplifting the traditional ways and can help voluntarily for creating documentary video productions for the same are also welcome.